Josh Brolin in performance capture suit on the set of Avengers: Infinity War. When io9 visited the set of Avengers: Infinity War last year, we were specifically told we wouldn’t get to see was Josh Brolin as Thanos. Now, with the upcoming release of the Blu-ray, everyone can see him in all his motion capture glory! io9 is excited to debut this exclusive behind the scenes clip from the home release, which will premiere digitally on July 31 and on Blu-ray August 14. 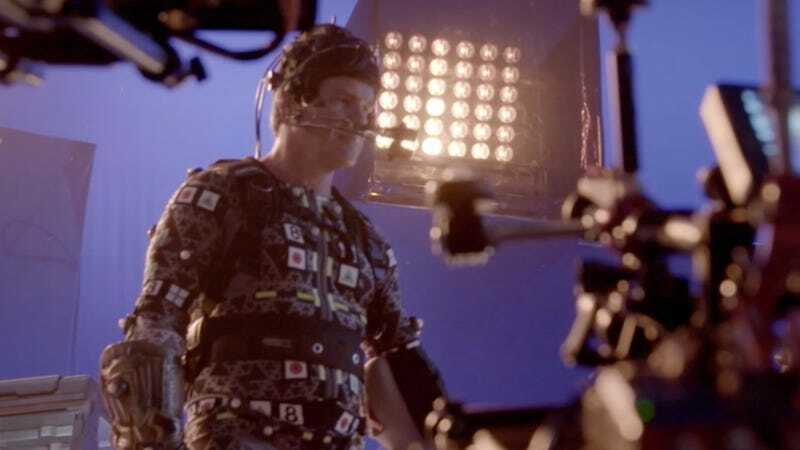 Here, we get to see Brolin in his full performance capture suit, acting as Thanos, see just how much he was on set, and how much his performance comes through in the character. Check it out. I think out of all of that footage, the best part is near the end when we see Brolin with the Thanos cut out above his head during the film’s opening. It’s excellent how goofy those things can look. See this clip in its full context and much more when Avengers: Infinity War comes to digital on July 31 and Blu-ray August 14. And click here for the full list of extra features.